A Syrian rebel fighter watches smoke rising from an explosion at an unknown location in Idlib province, Sept. 5, 2018. The Russian military confirmed that airstrikes were carried out on Syria's last major rebel stronghold of Idlib. International calls for restraint grew Wednesday for Syria and its allies, Russia and Iran, to avoid a bloodbath and humanitarian disaster in Syria's Idlib province. The northwestern province along the Turkish border is the last major part of Syria in rebel hands. Syrian forces are surrounding the province, and observers say a multiparty operation may be imminent. Meeting Wednesday with the emir of Kuwait, Sheikh Sabah al-Ahmad al-Jaber al-Sabah, President Donald Trump called the situation in Idlib "very sad." "That cannot be a slaughter. If it's a slaughter, the world is going to get very, very angry and the United States is going to get angry, too," Trump added. When a reporter asked Trump if he was not going to let an attack on Idlib happen, the president said only that he was watching very closely. The 10 nonpermanent members of the U.N. Security Council issued a joint statement Wednesday urging all parties in Syria to show restraint. They said a military strike on Idlib would lead to a "humanitarian catastrophe." The entire council is scheduled to meet Friday to discuss the crisis, while at the same time, the presidents of Turkey, Russia and Iran are planning to hold a summit in Tehran. Russia and Iran are Syria's top allies, and Turkey fears another refugee crisis along its border if Syrian forces attack Idlib. 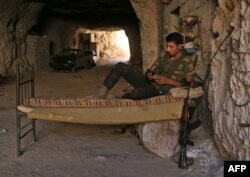 A Syrian rebel fighter rests at an unknown location in Idlib province, Sept. 5, 2018. The three nations last year declared Idlib to be a "de-escalation zone," and Turkey says the cease-fire inside Idlib must not be violated. Moscow, however, has called Idlib a "nest of terrorists," the word it uses to refer to the rebels. The Syrian Observatory for Human Rights said Russian airstrikes on Idlib killed at least nine civilians Tuesday. Turkish Foreign Minister Mevlut Cavusoglu met with his German counterpart, Heiko Maas, in Ankara Wednesday, in part to send a message to Moscow that such attacks are unacceptable. Cavusoglu says Russian and Turkish officials have been holding talks on preventing a military strike on Idlib. "We don't find it correct that the [Russian raids] happened before the Tehran summit," he said. "If the problem here is the radical groups, a common strategy needs to be adopted. Joint work can be done to eliminate these groups, but the solution is definitely not to bomb Idlib in its entirety." Maas said Germany was also concerned about massive bloodshed and "looming humanitarian catastrophe" inside Idlib. About 3 million people are in the province. Many of them are rebels and their families who went there after being given a chance to evacuate from other areas formerly held by rebels before Syrian forces moved in.